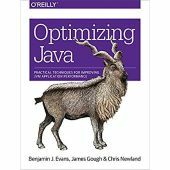 How does your book (Optimizing Java by Ben Evans, James Gough & Chris Newland) compare and contrast to Scott Oak's definitive guide, "Java Performance The Definitive Guide", which discussed Java Optimization in detail. And what percentage of your code samples are discussed in the book. Last, in your opinion, do current JVMs or CPUs have much impact on the practice of Java Optimization. As the book promo is over, I'm not sure if Ben will see this. A big differences is that The Definitive Guide came out in 2014. Things change over time so, things change. Optimizing Java doesn't have a lot of code examples. It's mostly at a higher level. Not about which data structure you should use.